The Neptune Memorial Reef is perfect for folks who want to spend their eternity sleeping with the fishes but also want to give loved ones a neat place to visit their remains. Folks can have their ashes combined with forms for a reef that is growing over the faux ruins of what looks like a lost city. Top image from Neptune Society. Technically, the memorial reef, which was conceived by Gary Levine and designed by Kim Brandell and sits off the coast of Key Biscayne, Florida, isn't a cemetery but a cremation memorial, similar to other projects like Eternal Reefs. The deceased person's cremated ashes are mixed with the cement on which the reef can grow, transforming a barren stretch of the ocean floor into a living memorial. 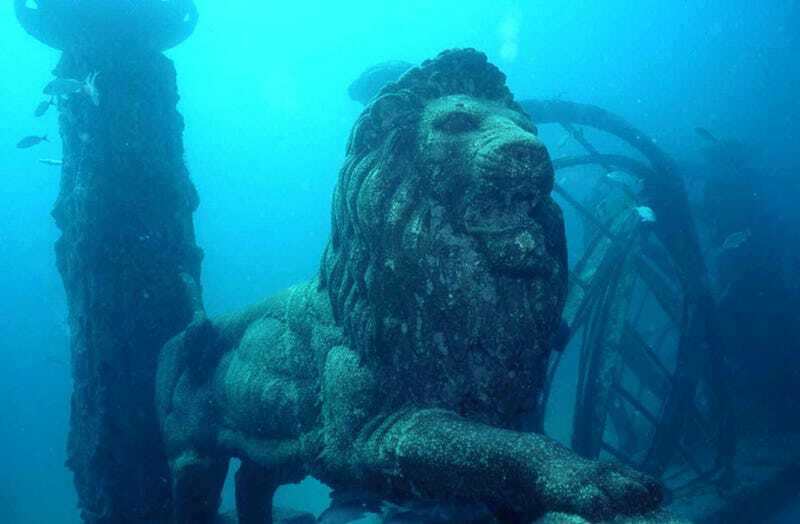 What makes the Neptune Memorial Reef different is its appearance, with its gates, benches, columns, and statues, that look more and more like forgotten remains the more the reef grows. Folks can have their remains interred in one of the larger structures, or cast into the forms of starfish or shells and placed around the fanciful city. Visiting your loved one's remains might be a bit more complicated when they are part of an underwater reef, but certainly more interesting as well.